Welcome to another episode of Ted’s Excellent Adventure! 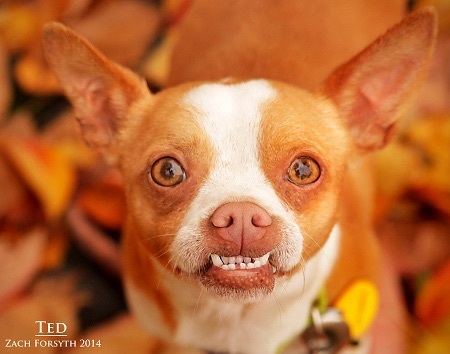 I’m your host Ted the 3 year old Chihuahua mix. I’v been hosting this adventure from the beginning. People often tell me my underbite smile was made for the camera! Even though I’m in the public eye often, I’m a bit of a sensitive guy. That being said a home with no kids is best for me, but once you get to know me you’ll see that I’m a super sweet guy to all. On this weeks episode, I’ll be looking for a forever home for the holidays. Need a seat warmer before Thanksgiving dinner? A dish washer? A cuddle buddy for your after turkey nap? That sounds like a life long adventure and I’m up for it! Schedule and appointment to meet me at pixieproject.org. I come neutered, microchipped and current on vaccinations. Adoption fee $250. Let’s do this!